D series paper edge protector line, Max. speed is 30m/min. SANPPL-120D is for L profile paper edge protector production. Through changing molds, it can produce U profile protector and flat board. Max. speed is 30m/min. SANPPL-120D is for L profile paper edge protector production. Through changing molds, it can produce U profile protector and flat board. It can produce two and three types protectors by changing the position of molds without changing them. SANPPL-120D line is one paper protector production line with PLC control, pneumatic pressing, composite stands and precise cutting. Printer and heating device can be added. 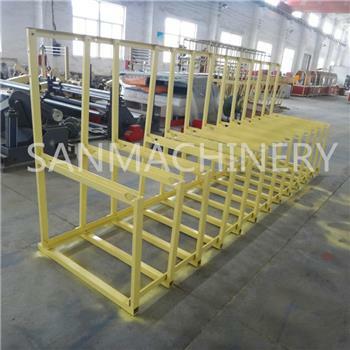 To guarantee machine production quality and service quality, we are managing our factory and producing machine as per CE certification and SGS system. We are professional for paper protector machine. We supplied machines to all over the world such as Chile, Indonesia, Poland, Italy, Argentina, Slovakia, Czech, Egypt, Mexico, Hungary, Croatia, COTE D'IVOIRE, Kenya, USA, Vietnam, Thailand, Philippine, Macedonia, Colombia, Turkey, South Africa, South Korea, UAE, India, etc.